Only 5.8 Pounds To Go ­— The authorities say we eat 5.9 pounds of grapefruit each year. Jonathan Martz may change those statistics if he has anything to say about it. Don’t let the sour face fool you – the youngster really took a liking to the pink variety. February is National Grapefruit Month, so be sure to take your favorite grapefruit to lunch. Lower Swatara Township police officers are looking forward to the warming trend in the weather predicted this week. They’re hopeful that the warmer weather and the absence of new snowfalls will bring them some relief from writing tickets for illegally parked vehicles. Last week, Township officers were kept busy writing nearly 140 tickets for owners whose cars reportedly weren’t moved in time to allow municipal snowplows to open Township streets. The parking crackdown came in the wake of a decision by the Township Board of Commissioners to enforce municipal parking regulations established to deal with emergency situations. That decision reportedly angered more than a few Township residents, many of whom called the municipal offices to complain that their cars had been ticketed. Township officials allow residents a “reasonable period of time” to get their cars off the streets, Malwitz noted. Cars not removed within that period are then ticketed. He said residents were advised about the emergency situation on Tuesday through local radio and television stations. The emergency was declared at noon and residents were given until 6 p.m. to move their cars, but the Township didn’t start issuing tickets until after 7 p.m.
We were tempted to cheat. Maybe substitute lemon slices, squirt juice in their eyes, or soak the samples in the most mouth-curling vinegar we could find. But ethics demanded we play it straight. Still, we were dumbfounded, kids gobbling up grapefruit, faces all aglow as though eating their favorite candy? Come on, where were the eye-squinting, tongue-protruding grimaces we had expected? For sure, they weren’t to be found on 3-year-old twins Jonathan and Rebecca Martz, nor 2-year-old Lindsey Jenakovich and not 1-year-old Gregory Wilsbach. These four little tadpoles, all of them from Middletown, tore into the notoriously tart fruit like there was no tomorrow. Was it a case of the winter hungries? A case of complying with Mommy-always-told-me-to-smile-for-a-camera? Or was it the promised cookies to come at the end of the experiment. 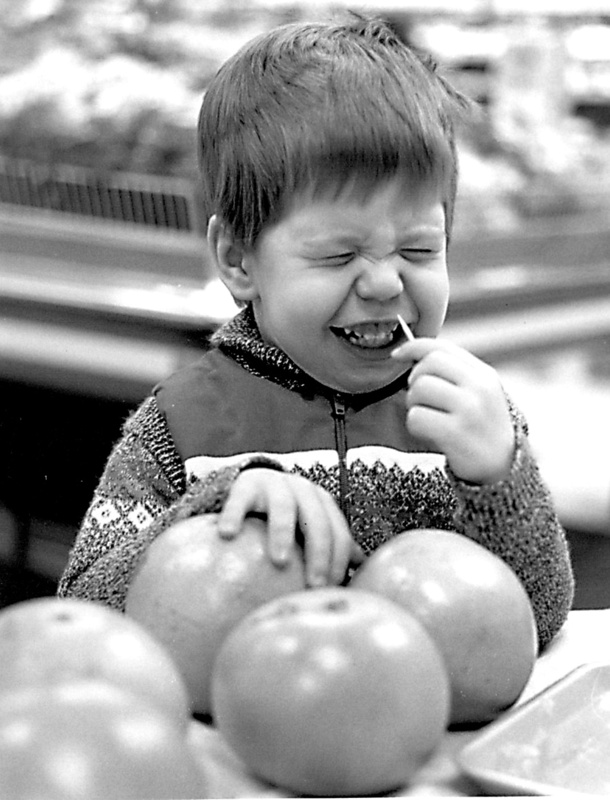 Even the gracious host of this unscientific taste test, Nancy Carbone of Fox’s Market, was amazed, replacing the quickly emptied plate of pink grapefruit with a plate of the white, mouth-puckering variety. No luck. The little diehards gobbled that up with great gusto, too. “I’m surprised – they won’t eat it for me,” said Carol Wilsbach, who after some intense interrogation revealed that the children had not had any morning snack prior to their appointed arrival at Fox’s. Carol? Okay, finally after 15 minutes of coaxing, we did manage to get a small pucker out of Jonathan]. Highspire Borough Officials were scheduled to meet Tuesday afternoon this week to open bids for the first phase of a proposed major project that will renovate and upgrade the community’s municipal building on Eshelman Street. A total of seven contractors attended a pre-bid conference held at the Borough Building on Wed., Feb. 9 and expressed interest in bidding on the project, but, as of this past Tuesday morning, it was not known how many would actually submit bid proposals for the $350,000 building project. Montgomery said Council will probably review those bids at its regular meeting this week, but there was no indication whether Council would take formal action at that meeting to accept a bid or to award a contract for the proposed work. However, Council did take action at its Feb. 9 workshop session to instruct Montgomery to arrange a meeting with citizens in the Cowtown district for Mon., March 7, to discuss the planned reconstruction of several streets in that neighborhood. Streets targeted in the major project include Charles, Jury, Mummau and Wetzel streets and Mary and Bank avenues. Montgomery said residents on those streets will be invited to attend the March 7 meeting, but the meeting will be open to all residents in the Cowtown area. The street’s named above are in Phase I of the major reconstruction project. That part of the project is expected to cost $133,410. Phase II, which will include all other streets in the Cowtown area, is expected to cost $107,870. Work on that phase of the project will be completed in 1995, Montgomery explained. Crime watch. Town watch. Community alert. Block or neighborhood watch. Call it what you will, the concept is the same: citizens actively helping police control crime in the community. It is not a new idea, but according to one area police chief, it is an idea that has, and sometimes still is, met with strong resistance by those in uniform. “Some departments still frown upon it. They have the attitude, ‘We’re the experts, you’re not. You’d only get in our way,’” said Elizabethtown Police Chief Robert Ardner. That philosophy became the cornerstone of police operations all across the country, but Ardner maintains it is philosophy that no longer serves law enforcement well. “It has hurt police professionalism and increased the alienation the public feels toward police,” Ardner said. “Meanwhile, if we could do it (control crime) ourselves, would we have the soaring crime rates we have?” he asked. As Ardner sees it the public-stay-out philosophy needs to change. Police need to welcome citizen involvement, to form partnerships with those they serve, Ardner said, adding that these partnerships can only occur if citizens are interested and are willing to make a long-term commitment. Fox’s Own tuna salad, $3.79/lb. Whole smoked picnic hams, 88¢/lb.